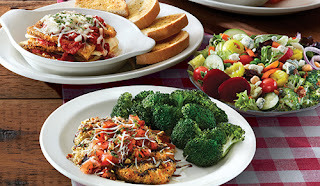 All-Star Salad Bar Dinner Deals Roster – only 10.99! The Olympics will be here before you know it, and we’ve filled our new Salad Bar Dinner Deals with an all-star lineup that could rival Team USA! Available from 4-9PM, choose from any of the following delicious dinners and enjoy our Soup, Salad, & Fruit Bar for only $10.99. A summertime fan favorite! This dish features herb-crusted chicken breast and is topped with our homemade bruschetta, which features fresh, local tomatoes (in season). It’s finished with a balsamic glaze, Asiago cheese, and is served with your choice of one side, bakery-fresh rolls and our Soup, Salad & Fruit Bar. A new Italian classic that has been recently added to our menu, it features hand-breaded local zucchini (in season) layered with locally-made sliced ricotta cheese (from Emerald Valley Farms, Washington, PA) and marinara sauce. We then top it off with mozzarella and Asiago cheese, and serve it with garlic toast and our Soup, Salad & Fruit Bar. This dish features our creamy Alfredo sauce on a bed of penne pasta. We then top it with strips of grilled chicken breast, fresh broccoli, and Asiago cheese. It’s served with garlic toast and our Soup, Salad & Fruit Bar. Eat smart with this low-calorie dinner that includes a flaky sole fillet lightly crusted with Parmesan breadcrumbs and drizzled with butter and fresh-squeezed lemon. It’s served with your choice of one side, bakery-fresh rolls, and our Soup, Salad & Fruit Bar. One of our all-time guest favorites! This dish features oven-baked cod, stuffed with our homemade blend of crabmeat, shrimp, spinach, onions, cheddar cheese, and cracker crumbs. It’s served with your choice of one side, bakery-fresh rolls, and our Soup, Salad & Fruit Bar.